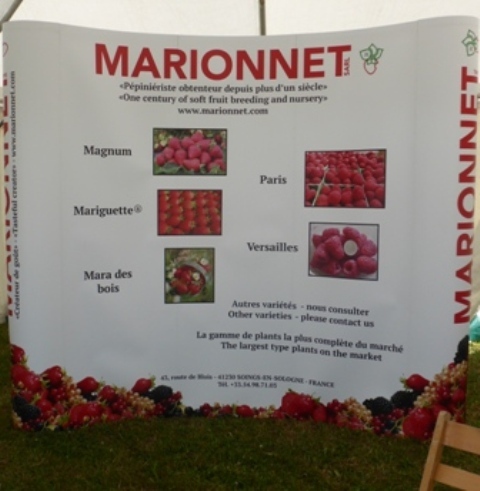 The event showcases many aspects of fruit production and marketing; Soft fruit has always been the major attraction and the soft fruit marketing group Berry Gardens is always a busy trade stand. 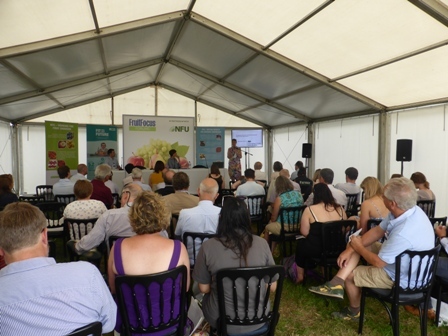 Over the last decade, the viticulture industry has taken an increasing presence at Fruit Focus. 'Vines to Wines' is an event set within Fruit Focus, bringing together all those involved in the growing, production, distribution and sales of still and sparkling wine in the UK. In partnership with the United Kingdom Vineyards Association and English Wine Producers, it stimulates, encourages and explores the latest technical developments and business opportunities for wine production, showcasing every aspect. Opening the Forum; NFU Vice President Guy Smith. Guy said it is very important to get MP's out onto farms to ensure they fully understand the issues which will influence the future of sustainable home grown fruit. Guy quoted David Lloyd George who said; "Confidence is the best fertilizer for the soil" and if we are to fully utilise the potential of our growers, confidence in the future is paramount. After a brief overview of 'Pre-referendum' objectives, Chris outlined the NFU objectives of 'Post referendum' farming and growing. Halt and reverse long term declines in self sufficiency; plan for increasing horticultural and agricultural productivity and competitiveness; stimulate investment across the industry so we can grow more British produce for a growing population; ensure the drive to increase British production is at the heart of policy making across all Government departments. 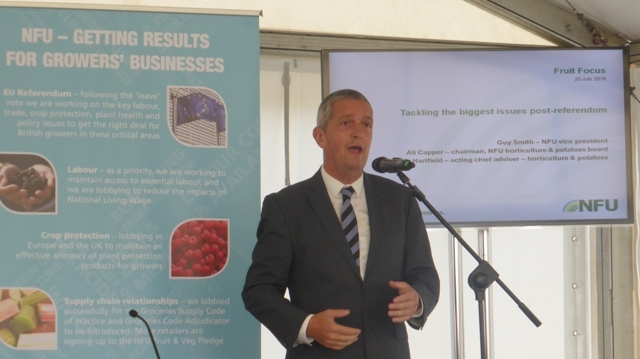 Ali Capper told the packed Forum, "It is so vital for us to have opportunities such as Fruit Focus to meet producers and hear their views," - "Now more than ever we need a single voice for our industry to ensure our messages, particularly on labour availability and crop protection are heard by our new Government team. Without labour at the time we need it, UK horticulture alongside other farming sectors will simply not be able to deliver the produce to our supermarket shelves." Ali Capper farms with her husband on the family farm owned by Richard, Ali and his father; Stocks Farm is situated on the Herefordshire / Worcestershire borders in the village of Suckley. The family grow a diverse mix of crops - hops, cider apples and dessert apples. 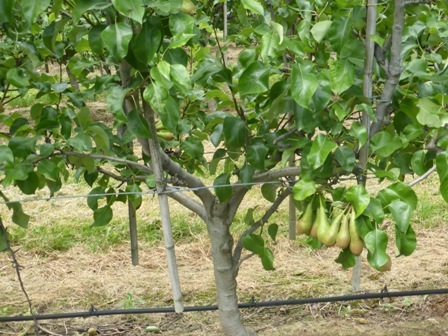 They grow 90 hectares of top fruit - varieties include Gala, Braeburn, Red Windsor for supermarket sales and Dabinett and Harry Masters for cider production. 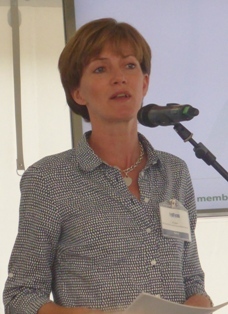 Ali's experience of growing crops and employing harvest labour from the EU is an invaluable asset with the many complex issues which need addressing by The NFU 'post Brexit' - she leads a very busy life and that very morning had been involved in Conference calls with the 'full' Board members of NFU's Horticulture and Potato's Board. Ali said she works very closely with the rest of the farming industry; referring to the future, Ali told the audience it is very unlikely we will have 'free movement' of labour. A points based system similar to Australia is favoured by the NFU but it is important we lobby government to ensure they fully appreciate the importance of maintaining harvest labour for harvesting our crops and providing the UK with sustainable home grown produce, rather than the option of a 'backward step' to large volumes of imported produce. 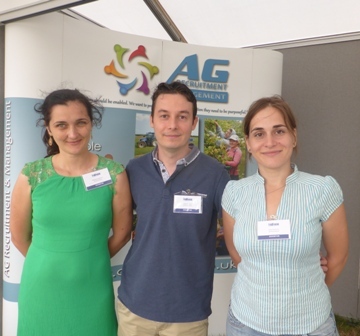 The importance of 'returnees' - regular harvest workers who have developed a working relationship with UK growers is a very important issue in retaining a labour pool for UK growers. Letters have been sent to David Davies - Principal Secretary of State for Exiting the European Union, and Robert Goodwill MP outlining what our industry needs to safeguard home produced produce. Robert Goodwill is now working in the Home Office as Minister of State for Immigration. Delivering self sufficiency has been 'trumpeted' by successive UK Governments, but we only produce 11% of the fruit we consume; without immigrant harvest workers, the UK percentage could easily fall to a negligible level! On a day when Christine Tacon spelt out the need for producers to come to her where they felt retailers had breached the Code, there was a feeling of optimism around the show that the sector was moving forwards. 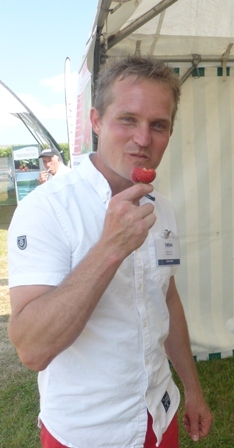 "Consumer demand for berries continues its significant growth," commented Nick Marston, Managing Director of Berry Gardens. "The market is now worth over a billion pounds, with growth of 17.7% in value 'year on year' with significant opportunities across many categories." 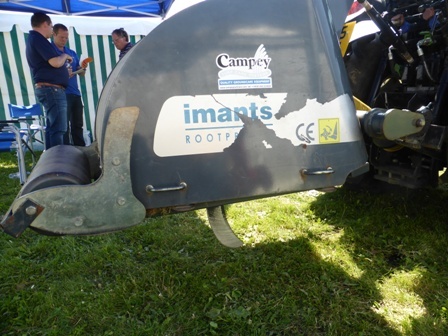 "We had a tremendous show," said Claire Seymour of NP Seymour, "the level of interest in our driverless tractor demonstrations was huge. 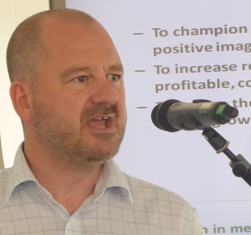 The appetite for precision tools and ones which deliver efficiences, management information and, in particular, labour savings is only going to increase and encourage us to innovate further." 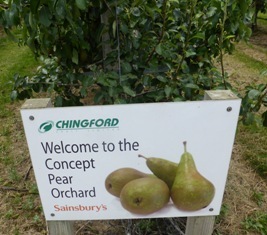 The Concept Pear Orchard came into being in March 2009; the inspiration of Sainsburys with financial input from Chingford Fruit Ltd and the site provided by East Malling Research. 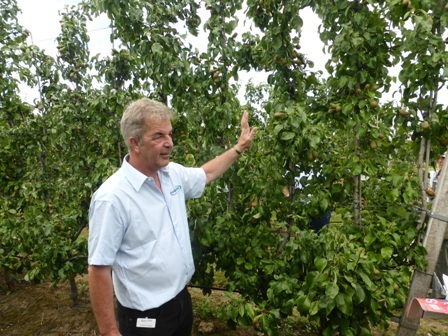 Graham Caspell told the visitors the Concept Orchard had been planted in March 2009 and for the first seven years the clear objective was to record total yield from each of the systems in the trial; by leaving pears on the tree that would not meet commercial standards, however now the initial mandate of the trial has passed, he is free to exert his lifetime knowledge of pear growing and able to modify some of the pruning and in particular carry out thinning in keeping with commercial practice. 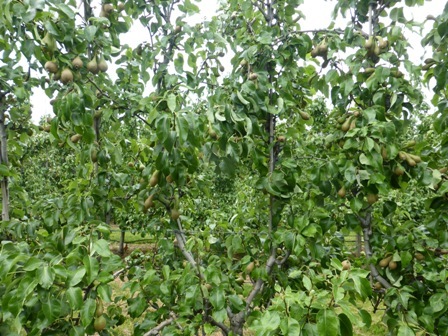 Historically, UK Conference pears have averaged only 18-20 tonnes per hectare. With Dutch and Belgian growers achieving yields of circa 80 tonnes per hectare, there is a massive differential. Graham said he would be happy to achieve 60 tonnes per hectare and to date the performance suggests that may be possible. 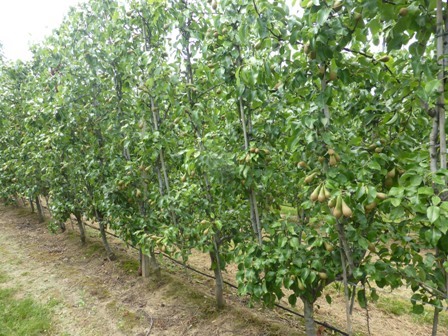 A yield of 70 tonnes was achieved in 2015 on the V system trees; The English system; a typical system with a single leader and base branches did 44.5 tonnes - the Run-through system, where the trees are allowed to run up with a small 'skirt' of branches did 57.8 tonnes and the double head, where two leaders are grown 'in line' of each tree did 51.6 tonnes. An average yield of 56 tonnes per hectare across all systems was recorded in 2015. That is total fruit picked, not marketable fruit after grading. The overall results are very encouraging. 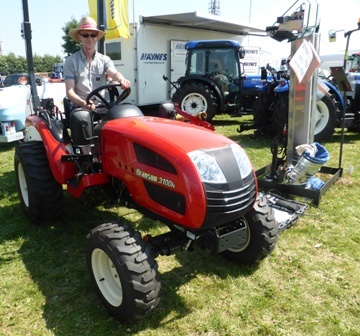 Machinery is always an 'eye catcher' - new 'boys toys' and I guess new 'girls toys' too are displayed in all their finery; new tractors, sprayers, cultivators et al. 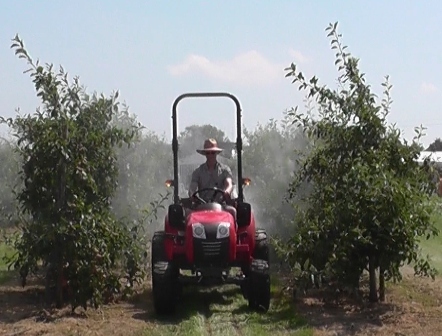 Root pruning is an increasingly important strategy for top fruit growers. Earlier a mention of 'boys toys and 'girls toys' became appropriate when Claire Seymour demonstrated the The Fendt ProbotIQ Xpert system at Fruit Focus; Claire added an excellent narrative to the demo as the tractor and sprayer traveled up and down rows of apple trees before, parking itself and turning off. Once safely 'parked' the system sends a message to the operators mobile phone! 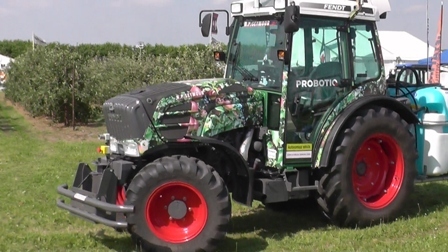 The Fendt ProbotIQ Xpert system is an add-on for the Fendt 200 Vario series orchard tractors. 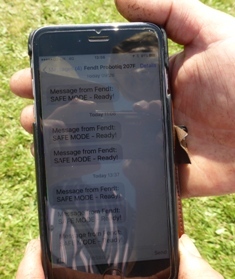 It integrates with the existing Fendt electronics to allow the tractor to drive and operate autonomously. It uses patented Teach and Playback technology which is very easy to use. To programme the system simply press the 'Teach' button to start recording a route. Now start driving, mowing and spraying. The system stores every action (steering, accelerating, mowing, spraying) multiple times per second. When you are done, press 'Stop' and you have programmed a route. The system is able to store hundreds of routes. 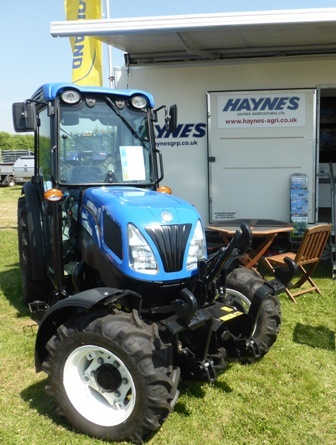 To repeat a recorded route simply select the appropriate route and drive the tractor to the starting point. 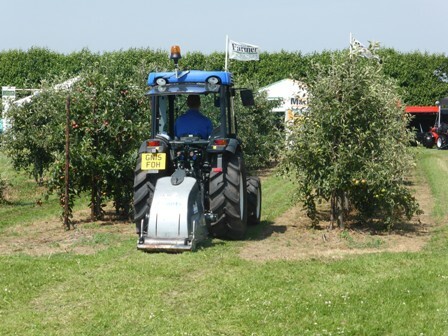 Press 'Go' and the tractor will repeat the recorded route precisely and unmanned! 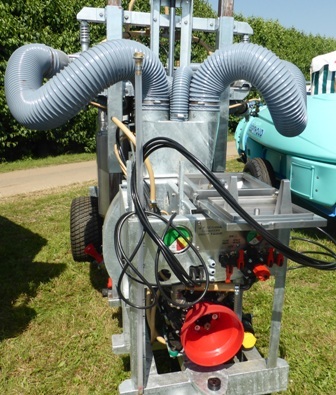 Below:The Fendt ProbotIQ Xpert system and an orchard sprayer - "look no driver"
Also on the N.P.Seymour stand this strawberry sprayer with the capability to spray rows on the ground or on table tops. 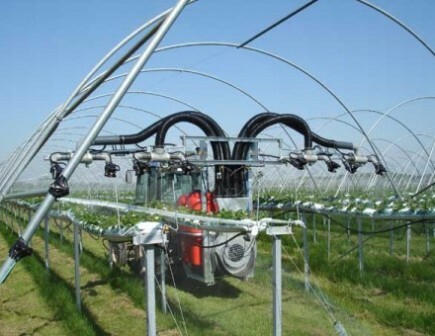 Manufactured 'in house' these air-assisted sprayers can be built to spray up to 8 rows of table-top strawberries in tunnels in one pass. They have a fully galvanised chassis and a clever specialist manufactured stainless steel tank to make best use of space. 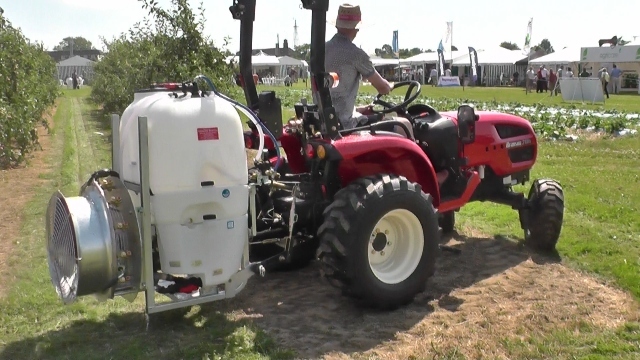 Capable of up to 1000 litres per hectare. 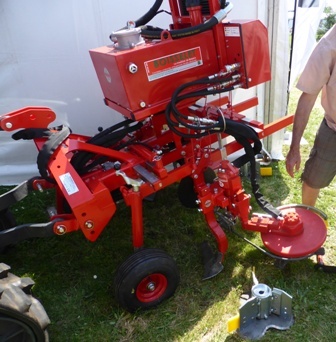 Each machine is built to suit individual requirements. 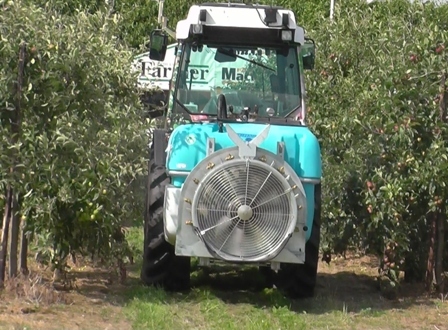 This machine has a small but powerful fan unit which means it can be run by a small tractor. 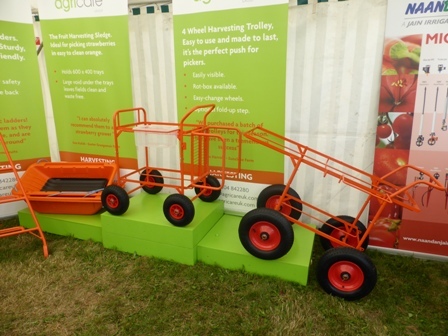 Below: The glamour of expensive 'boys toys' is only part of Fruit Focus; on the Agricare stand these picking trolleys underpin modern table top strawberry production - Members of the AG Recruitment team specialists in supplying well trained harvest workers from Romania and Bulgaria. Click on Marionnet to view.